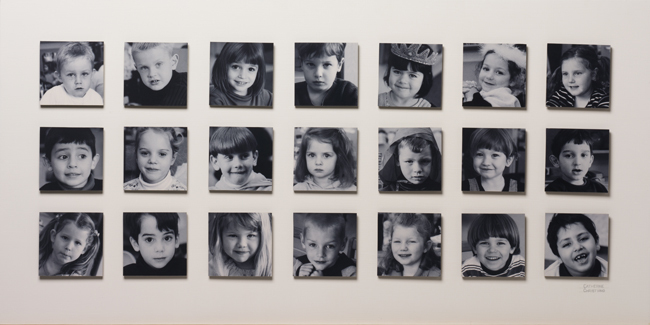 Catherine Christiano, Mrs. Varga's Children, 2003, photography with statement, panel is 19 3/16 x 38 3/16 inches plus statement. Photo credit: Paul Mutino. Collection of the Old Lyme Phoebe Griffin Noyes Library. When my daughter was in preschool, I was invited by her teacher, Maria Varga, to photograph the students of both her morning and afternoon classes. Her plan was to have some nice images to give as gifts for Mother's Day. I saw it as not only a way to give something back to a great public education program and an awesome teacher but an opportunity to create a unique type of portrait. Maria Varga is the kind of teacher everyone hopes their child will have; a teacher who refers to her students as her children and respects each one as a unique individual. For this portrait I photographed each child independently, attempting to capture their individuality, and assembled them in a matrix to form a collective whole. Maria Varga is represented by her voice in a statement that she wrote that hangs adjacent to the panel.